Questige is proud to announce and welcome Tom Emerick as a new health care advisor. Emerick brings a wealth of knowledge to new and existing clients as the top consultant for Burger King, British Petroleum and Walmart. 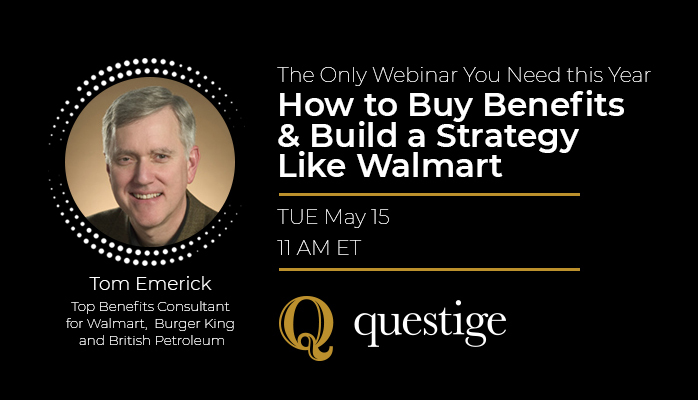 His first project will reveal cost containment insights, strategies and case studies for an upcoming webinar “How to Buy Benefits & Build a Strategy like Walmart” on May 15, 2018, at 11:00 AM ET. Tom comes with 15 years of experience at Walmart, designing global benefits for more than 1.6 million employees. His book, Cracking Health Costs, discusses how companies can fight back against rising healthcare costs. In 2000, he received the prestigious “Distinguished Former Student” award from the University of Central Oklahoma. He has served on a variety of boards, employer coalitions, and associations, including being on the board of the influential National Business Group on Health and the U. S. Chamber of Commerce Benefit Committee. The 60-minute collaborative webinar, tailored for C-suite executives and business owners, showcases strategies to deliver better health care, while saving money for the business and employees. Tom tackles the health spend by accessing the best health systems in America to help high utilizers avoid misdiagnosis and improper treatment.